To the above list of celebrities we should also add Rhys Jones – sometimes to be found hovering over a war-games table – who assisted Peter Jackson et al by being the exhibition’s Executive Director. The exhibition will be continually developed as the one hundred years anniversary of the First World War rolls on. The good Fraulien von Peter herself and von Peter himself both went a little camera crazy – albeit with their phones! What follows is a few of the photos resultant of the electronic shutter madness. Despite the maniacal photographic activity only the more photogenic exhibits got any attention. There were many other exhibits of uniforms, weapons, equipment and coloured photographs that are not represented here. von Peter himself has no qualms about blaming the good Fraulien for such oversights! Many of the exhibits were behind glass with bright lights and other glassed in exhibits across sometimes narrow walkways. As such reflections were often a problem, especially as photos sometimes had to be snapped rapidly in between other visitors – selfish gits! 😎 – with little time to prepare. So some of the photos actually showcase two exhibits – the prime target of the photograph and a reflected unintentional secondary exhibit reflected in the glass. Such are the results of war time photography. A representative model of one of the forts to be found in Belgium and France. It would make for fantastic terrain to game through! The French and Belgians may have had their forts but the Germans had some fort crackers. There was a 1/3 model of a Big Bertha siege gun being loaded with its next round but no satisfactory photo of it – one must have standards you know when one is running a high class blog! So here is the proof of the models existence. There was a rather busy 1914 scene with a plane flying overhead, a limbered 18 pounder and a London bus. Several photos are presented covering the action. The French built plane is a Farman M./F.11 otherwise known as a Shorthorn. It has Belgian markings … not that this photograph shows them! Also in sight is part of the 18 pounder limber. The front of the militarised London bus … unfortunately in shadow. Apparently about 900 London double decker buses made it to the war. Their duties ranged from troop transport to ambulance to mobile pigeon lofts! Originally they served in their red civie colours but this was found to be somewhat unwise on the battlefield so ubiquitous khaki was applied. The back of the bus showing off one of the civil street advertising hoardings albeit khaki’ed over. The rear of the Shorthorn – the plane for those with feeble memories! – showing a. the Belgian markings and b. that it is a ‘pusher’. The exhibited plane is a replica but it has an original engine! The 18 pounder is just out of shot but the fodder attached to the limber is well in evidence. The strange bit bottom left is the edge of the bus. Part of life in a rather clean trench. Is that a pet bird, a carrier pigeon … or dinner?! The same French fort post bombardment. Modern conservationists would be apoplectic! Another exhibit crying out to be gamed over … although all the surrounding glass would need to go! A close up of the 1916 – Western Front Diorama. Rat-ta-tat-ta-tat. The Great War Exhibition is not the only First World War game on in Wellington. New Zealand’s National Museum – Te Papa – has also got in on the act with their Gallipoli The Scale of our War exhibition. Once again Weta Workshop are involved and this time many of the exhibits are much larger than life. This offering has yet to be annointed by an official visit from von Peter himself. But it will be. Many are the advantages offered up to those lucky enough to call New Zealand home but easy access to decent hobby paint ranges is not to be counted as one of them. Getting back into more regular painting von Peter himself discovered that a not insignificant influx of replacement paints was required. And of course The son & heir has been tottering on the edge of paint oblivion for a while. Time to purchase some more pigmentation liquids. But which ones? Games Workshop / Citadel paints are not as common as they once were but they are still around for the getting … however … the company insists on continually changing their colour ranges; the paints bottles have a distressing tendency not too keep their contents in a liquid state; and the accountants &/or marketers have lost the plot with their pricing. They have for many years been the mainstay of the paint stocks of von Peter himself but those days look to be coming to an end. Verdict – time to find an alternative. Vallejo are also easy enough to purchase locally and there are certainly plenty of adherence to their products but their dropper bottle packaging really does not sit well with the painting habits of von Peter himself. Verdict – possibility but hopefully can do better. 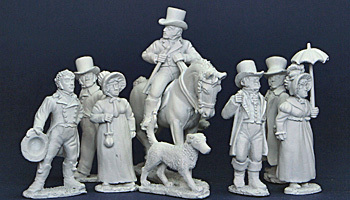 CNPK2 Napoleonic Civilian pack, mounted gentleman figure and horse + 2 ladies (figs sold only as a pack). There are a fair few tricornes in these packs but von Peter himself can happily live with this. from the Too Fat Lardies. None of us had played for a while except for Craig. He had never played! In the end we got through two games of large Napoleonic skirmish gaming and were so encouraged as to schedule another day of Sharp Practice gaming at the end of the month. Those new Front Rank civilians could be very useful for future Sharp Practice gaming. Oh, and sorry … no photographic evidence of the gaming was taken. That’s it. There is no more until the next time. This entry was posted in Front Rank Figurines, Sharp Practice, Social activities by von Peter himself. Bookmark the permalink. As far as paints go, I will say the current range from Citadel is very good quality which they have just expanded (again). The range is now VERY extensive and to a professional commission painter I think it would be heaven, but to me it is very confusing. I have moved more and more to Vallejo, but sometimes their total lack of organization (opposed to the very structured Citadel system) is equally head scratching. I live and die by paint recipes (and recommendations) and have yet to simply pick unrelated paints A. B, & C to mix and get the actual color I need. Like those that highlight or shade green with reds and blues, those are frontiers that I will probably never venture into. The Wargames Foundry triads seem a novel idea, but are hard to come by. A recent development that I have enjoyed is the themed paint sets that various companies are producing. Themed ones like Scale 75’s “Steam and Punk” or “Black and White” are neat for specific projects, but for the basics I recommend the Andrea Color sets. I invested into a number of these awhile ago and really got to try them out on my Viking Bondi. Lovely 6 paint set including the highlights and shade that you can vary for effect. I can’t wait to use them on my Napoleonics. They tend to be thicker with heavier pigment so they cover well, but can be thinned out as desired. They dry very flat so there’s no sheen left like other paints and protective sprays like Dullcote have no effect on the highlighting layers (usually make them disappear). That’s my 2 1/2 cents anyway. The link for the civilian minis are most welcome. I’m always keeping an eye for figs I can use for 1813. Either as farmers and townsfolk or even as armed civilians/militia. I have a few packs from the Perry Bros ACW line (The Rioters) that should work and also found a pack of armed civilians in Empress Miniatures New Zealand Wars range. I think it will be fun to have these about the battlefield or even “form up” as part of a scenario. Thank you for your well reasoned post. The Citadel paints may be very good and they have provided the bulk of my paints for several decades but I have not kept pace with their latest range change. I was going to buy a few paints a month or so back and was standing in front of one of their fully stocked display units … and was totally lost. My fault no doubt and I was called away before I could make sense of it all. But the straw that broke this camel’s back is the pricing. You don’t get many mls of Citadel paint for your dollar and it’s just been getting worser and worser! I was getting the uncomfortable feeling of being played for a fool. I’ll see how the Coat d’arms go and with The son & heir’s input take it from there. Thanks for that Jason. I’d heard of the P3 paints and even good things about them but they’ve never really come into close view. Perhaps it’s because they’re from an American company and my gaming view is more to the UK. And perhaps it’s because I have no interest in the Privateer games. Is the range useful for historic subjects do you think? Not that it really matters as I suspect there may be picking and choosing from several ranges in my future. That was an interesting bit of history of the P3 paints. It’s amazing how far these people spread through the hobby. I’ll be interested to her more of his enemanence’s report on the paints – so please get cracking! So will I! No painting for well over a week now. My life is just dribbling away on comparative trivia! Soon … hopefully soon. Got seems that Madame Von Peter is spoit rotten to have such a fine outing Peter! What more would any young lass yearn for 😉 Seriously though quite lovely shots of the exhibits. Paints are the perennial fly in the ointment here too mate. I do have to agree with the pricing insanity of GW and the fact that they are soon dryer than my glass when I am around a few of my gaming mates makes them even less desirable a purchase. I will flow your CdA dalliances with a keen eye. Hopefully I’ll get to use some of the Coat d’arms in the nearish future … and with a spot of luck I’ll even remember to report in. As a teaser they are not totally new to me as I have the Coat d’arms Horse Tones paint set and have been happy enough with it … though I have yet to use the white which if memory serves is reputedly a bit thinner than some. Thanks for sharing your experiences of that fantastic exhibition, your Vonship. It reminds me a little of the entry into the Tank Museum at Bovington, which you enter through the allied lines but somehow end up in a German dugout experiencing their first view of an allied tank breaking down the wire in front of their position. These exhibitions are extremely well done and thought provoking, yet in many ways a million miles away from the horror those young men experienced….That’s not to say we shouldn’t appreciate this superb attempts to at least make visual commemoration of their experiences!